5/31/2016, Daily Takes – It’s time to get serious about the Wisconsin road, bridge and highway crisis, and it’s time for conservatives to lead the way toward resolving it. 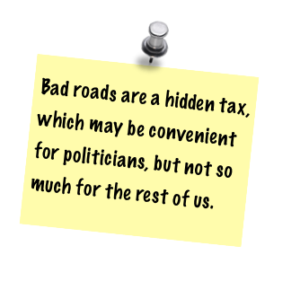 Bad roads are a hidden tax, which may be convenient for politicians, but not so much for the rest of us. 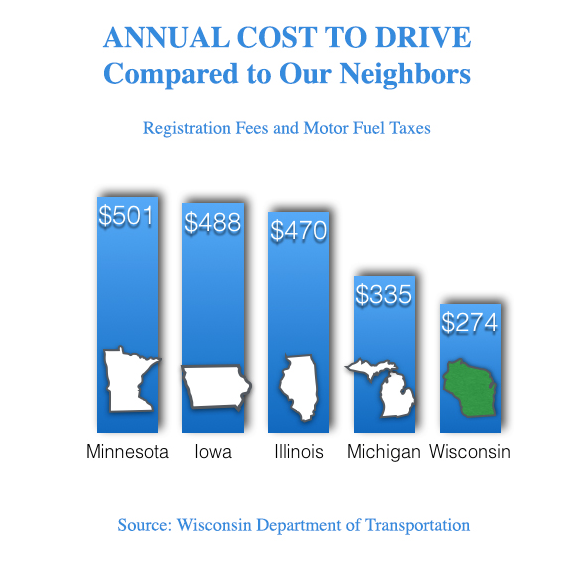 A recent nonpartisan report indicates vehicle maintenance, avoidable accidents and congestion delays ding Wisconsin drivers for more than two thousand dollars a year. If we don’t engage in smart, conservative budget practices for infrastructure, if we just keep going along as we have, the crisis gets much worse. For instance, let’s say the next transportation budget bascally maintains the status quo. Imagine that lawmakers pass a plan based on current law – no tax/fee increases and limit bonding to $500 million per biennium; and they hold all local aid programs at current levels (Which, by the way, put general transportation aids at 2010 levels and transit operating assistance at the 2008 mark). Let’s say they instruct Wis DOT to prioritize system preservation, maintenance and safety over major projects and capacity expansion and defer or delay projects already in the pipeline. So, no cuts, but no real growth, ok? What would we be able to accomplish under that scenario? Well, ‘What’s two years?’ you may say. It’s a small price to pay, a minimal delay. But delaying projects causes a cascading delay for all future projects. If we just continue to hold tight under the misguided notion of what is conservative and therefore don’t invest in resolving the curret crisis, over the next decade there will be 250 fewer new road projects, 800 fewer miles of roads will be rehabilitated or improved (thus increasing the miles of poor roads by 81 percent). This means 26 percent of all highways in Wisconsin will be in poor condition by 2027. Let’s be clear. These numbers are not some hype from the special interests, these numbers are the sober, honest analysis of Governor Walker’s Department of Transportation. 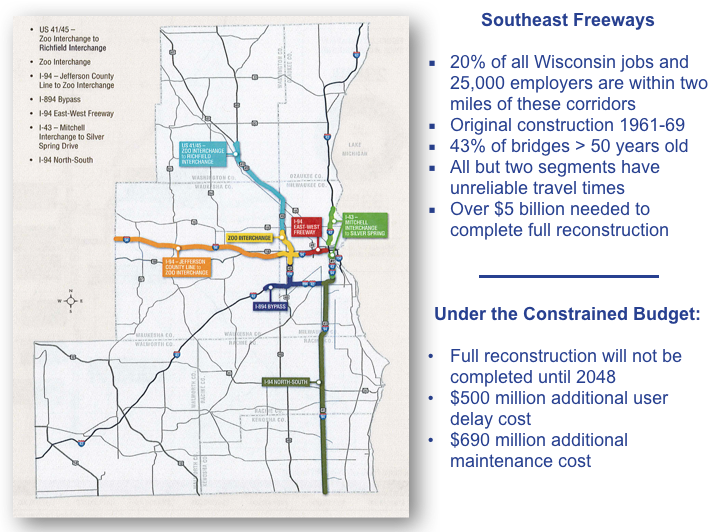 If Interstate projects are pushed back this far and our two lane highways in Wisconsin gradually succumb to being gravel roads, you can take all the ballyhooed economic development plans Wisconsin has for the next 25 years and kiss them goodbye. Wisconsin would be open for business, but getting your customers or your goods to and from here–well??? The fact is, our agricultural, manufacturing and tourism economies rely upon our roads. Their condition is a key component to Wisconsin’s overall economy. Every lawmaker favors their local project, be it the Zoo Interchange, Highway 23, I-94 or whatever, yet many are loathe to admit roads across the state are in desperate need of attention. But they are. It’s undeniable. Now, I favor the elimination of waste, fraud and abuse and question some of DOT’s reliance on roundabouts or traffic pattern deviations as much as the next guy. But the fact is, even if every employee of DOT were to be let go tomorrow and if DOT never built another pretty bridge or roundabout, we still face an annual funding shortfall of hundreds of millions of dollars just to address needed maintenance and construction. Liberals like to portray conservatives as anti-government. We’re not. We’re anti-waste and we favor limited government. As a state, the development and maintenance of our roads so that we have a reliable, safe and efficient transportation network is about as focused on core responsibilities as as you can get. Since 2011, Republicans in Madison have righted many of the wrongs of the previous Administration, including in the area of transportation. The immoral raid of the Transportation Fund has been paid back and Wisconsin voters passed a referendum to constitutionally protect the fund from future such abuses. Now, it’s time to address the looming infrastructure crisis head on. Across the state, local government, economic development and business leaders have been holding forums over the last few weeks to bring attention to the crisis, and to begin their focused appeal for leaders in Madison to “Just Fix It!” Well, count me in. I’m happy to work with the Transportation Development Association and others who are bringing this issue to light. I’ll support public officials like Waukesha County Executive Paul Farrow who knows strategic investment in infrastructure is the prudent (and conservative) thing to do. Conservatives have an opportunity to fix it the right way. If conservatives don’t admit our roads are in crisis and if we don’t encourage our lawmakers to responsibly address this crisis, the costs will continue to rise and the crisis will continue to escalate. This isn’t spin. It’s math. Paying more than we need to later because we put off making decisions today is not conservative. Ignoring the problem is not conservative. An over-reliance on bonding is not conservative–that’s merely kicking the can down the pot-hole filled road and leaving future decision makers and taxpayers in an even larger bind. Such a breakdown in the core function of government will lead to conservatives losing power in Madison. Voters will throw them out if they can’t get the basic core responsibilities of government right. When they are no longer in charge, the solutions proposed by their replacements won’t be as reasonable, efficient or prudent. Because of time, traffic, technology and some bipartisan budget blunders over the last decade or so, our surface transportation system is in crisis. Here’s to addressing the crisis now, the responsible way.